Former Big Break cast member (and Amazing Race cast member) Maiya is featured in the November issue of the magazine. Which can be found in some US markets - if your city has a Japanese grocer (and is a big golf town), you might find it. And if you can read Japanese, you'll get some good golf tips from Maiya. Because it's her gloves you're looking at, right? Anna Rawson used Instagram to post this photo on both Twitter and Facebook. Those golf gloves she's wearing? They are G/Fore brand. Anna's comment with her photo was this: "What would I do without my blush @g_fore gloves!?!?!" These photos of Meghan Hardin are from a new photo shoot, recently completed. Is modeling in Meghan's future? She's open to more modeling gigs, but Hardin's focus remains firmly on golf. The Big Break Atlantis cast member was recently in Westchester, New York, for the Eric Trump Foundation Charity Golf Tournament, which benefited St. Jude's Childrens Hospital. Meghan was the pro in a "Beat the Pro" contest, and her hole on the course raised thousands of dollars, while overall the event brough in "millions," she said. "I'm friends with Eric Trump now and I met Donald Trump, Darryl Strawberry, Derek Lowe, and a few other celebrities and athletes," Meghan said. "It was really awesome because the athletes gave me some good motivational insight on making it into the big leagues." Coming soon, Meghan is playing the Greg Maddux Celebrity Invitational, Oct. 22-23, in Las Vegas. And she is entering the Arizona Open in November. Nikki Garrett had a great showing at the LET's Tenerife Open de Espana, finishing solo fourth. That ties Garrett's best finish of 2012 so far. She also was fourth at the Ladies Irish Open, plus the Australian has a seventh-place finish at the Prague Golf Masters. The photo above is from a photo shoot Nikki did a couple years ago for the Australian magazine Alpha (which is now defunct, alas). Here's a coincidence: Garrett's two LET victories to date happened back-to-back in 2007, at the Tenerife Ladies Open and Open De Espana Femenino. Now, those events are sort of combined, and she just had her best showing of the year at the Tenerife Open de Espana. 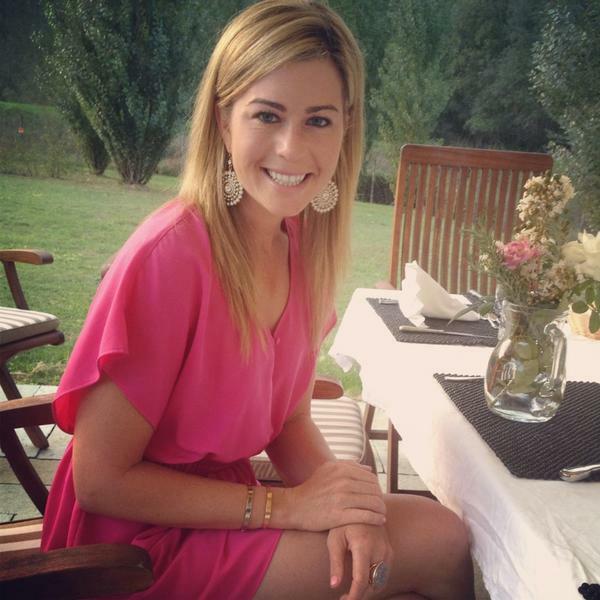 Here's Paula Creamer sitting down to dinner during her vacation in Italy. Creamer left for the vacation - which she tweeted was her first in long time - following the Women's British Open. It's why she isn't playing the 2012 Navistar LPGA Classic in Alabama. Dawn Shockley is a rookie on the Ladies European Tour, a rookie from landlocked Colorado. So when the LET visited Tenerife for the 2012 Tenerife Women's Spanish Open, she (along with fellow LET'er Frances Bondad) decided to hit the surf. You can see more photos on the LET website. Shockley played college golf at the University of Denver, where she was a 3-time all-conference selection. She turned pro in 2009. In 2011, Shockley played on the LPGA Futures Tour, posting a best finish of second play. She acquired LET membership with a Top 30 finish at Q-School. 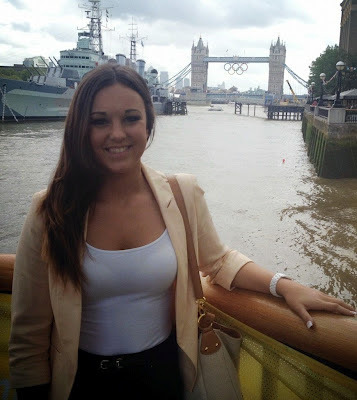 Another young golfer has launched her website: England's Kelly Tidy. We've added her new site to the sidebar golfer sites, listed in the right-hand column. The URL is kellytidy.com. The photo above, as you can probably tell, was taken in London during the 2012 Summer Olympics. Kelly won the Ladies' British Amateur Championship in 2010 and played on the victorious GB&I Curtis Cup team this summer. Look for her at LET Q-School later this year. If you're a fan of Golf Babes, then you're probably a fan of Big Break Atlantis. Or will be, if you haven't yet caught the Golf Channel series. Whether you want to watch it for the first time, or watch it again, you can now do so online. Full episodes of Big Break Atlantis are now viewable on GolfChannel.com. Check the Big Break Atlantis index to find the online episodes. And here are three of the cast members - from top to bottom, Allison Micheletti, Christina Stockton and Meghan Hardin. Alas, the magazine industry - the publishing industry, period - is a tough go. And GolfPunk went. The magazine's founders departed in 2006. But now they - and GolfPunk - and Anna Rawson - are back. GolfPunk has relaunched in a digital-only format - you can read the first issue here - that is attractive, easy to navigate, and full of good stuff. It's viewable in your browser, but also on smartphones, iPads and other mobile devices. And the first "Swingin' Sirens" feature in the first issue of the new GolfPunk features our old friend Anna in an interview, plus photos by Bo Bridges. In the interview Rawson explains what she's been up to since retiring from tour golf, and that includes work on a pilot television episode for CBS. You can jump straight to the Anna Rawson interview here.